Sir Lenny Henry and Roy Hudd have joined the cast of Broadchurch Series 3 as filming begins today (23rd May) on the final, eight-part series of the ITV drama. 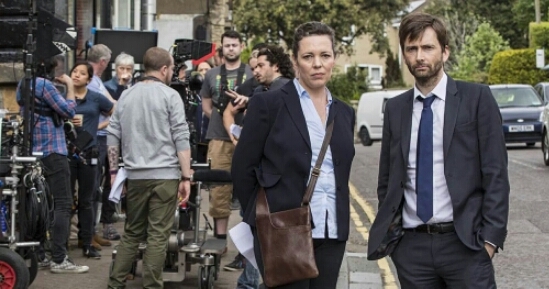 The award winning drama – created, written and executive produced by Chris Chibnall – celebrated its first day back by posting a picture of leads David Tennant and Olivia Colman (above) on set as they reprise their roles as DI Alec Hardy and DS Ellie Miller who reunite to investigate a new case of serious sexual assault. Also returning is Jodie Whittaker and Andrew Buchan who play Beth and Mark Latimer, alongside Arthur Darvill as local Vicar Paul Coates, Carolyn Pickles as newspaper editor Maggie Radcliffe, Charlotte Beaumont as Mark and Beth’s daughter Chloe, and Adam Wilson as Ellie’s son Tom. Sir Lenny Henry and Roy Hudd join previously announced series three cast additions: Julie Hesmondhalgh, BAFTA winner Georgina Campbell, Sarah Parish, Charlie Higson and Mark Bazeley who will play significant roles in the Dorset based drama. Broadchurch series 3 explores the consequences of a serious sexual assault as a Dorset community comes under the scrutiny of Hardy and Miller’s investigation. Based on a year of research with Dorset-based organisations who specialise in dealing with victims of sexual assault, and police advisors who specialise in investigating crimes of sexual violence, Broadchurch’s final chapter looks at the emotional cost to all of those involved and the irreparable damage to friendships and relationships. Broadchurch is co-produced for ITV by Kudos, Imaginary Friends and Sister Pictures. The third and final series will continue shooting in Dorset, Bridport, West Bay, Clevedon and Bristol throughout the summer of 2016.